Ian Christie scored the winner for Glebe Rangers on Saturday.INBM18-16 075SC. Saturday was certainly a very good day for teams from the Ballymena and Provincial Intermediate league in the second round of the Irish Cup. Sofia Farmer beat Limavady United 2-0 at Allen Park Antrim, Wakehurst saw off Larne Tech OB 2-1 after extra time away at Larne, and Glebe Rangers beat Silverwood 3-2 after extra time at Ballymoney. Coagh United were unfortunate to lose in a penalty kick shoot-out against Derriaghy while Dunloy, Ballynure Old Boys and Desertmartin all lost away from home. In the only Intermediate league game played Brantwood and Newtowne shared the points at Skegoneil Avenue with Newtowne again missing from the penalty spot making it the sixth time in five games. Glebe Rangers got off to a flying startagainst Silverwood with David Brown scoring on the first minute. The lead only lasted four minutes though as the visitors equalised on five minutes. Silverwood were not sitting back and went in front with their second goal in the 35th minute to lead at half-time. Glebe got back level after Pater Kennoway scored in the 65th minute, but they suffered a blow five minutes later as they had a man sent off. There were no more goals in normal time so it was on to extra time. And it was the hosts who grabbed the all-important fifth goal of the game as Ian Christie fired home to seal the win for Glebe. The punters outside of the league had Limavady starting their game against Sofia Farmer as favourites to progress to the next round as everyone were judging their opponents on last season’s performance. 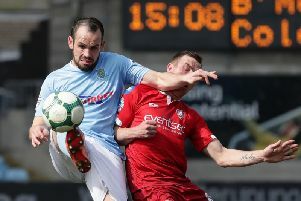 This was not the thoughts of everyone connected with the Ballymena League though as this time around Sofia are a match for any teams at Intermediate level and no doubt will be in the running to collect silverware at the end of season. Sofia who play a brand of football which is easy on the eye restricted Limavady to a couple of half chances in the first half and went in at half-time leading by a goal headed home from a free kick by Elton De Carvglho in the 38th minute. Sofia dominated the second half from the start then in the 60th minute the Limavady keeper was sent off for handling the ball outside the penalty box. With the extra man Sofia ran the show sealing the win after Elton De Carvglho headed in his second goal this time from a corner kick in the 68th minute. This was big win for the young Wakehurst team against Larne Tech Old Boys, who are a well drilled unit by Manager Cliffy Adams and they give very little away due to good teamwork. Chances were few in the first-half with no goals being scored before half-time. The Tech went in front in the 58th minute, but Wakehurst hit back straight away after Aaron Weir put Stuart Nixon into score in the 59th minute and what a nugget Manager Adams has found in Nixon. After this Wakehurst upped the pace of the game but could not force the winning goal before with extra-time was introduced. Wakehurst struck again in the 96th minute when Corey Price hit a rocket of a shot from 30 yards that sailed into the roof of the Tech to win the game for Wakehurst. Lisburn Rangers went in at half time leading by two goals against Ballynure Old Boys scored in the 31st and 43rd minutes then added a third goal scored in the 48th minute. Ballynure pulled two goals back scored by Kevin Amuneke and Gerard Southam and were well in the game until they had a man sent off with twenty minutes left. This more or less killed off any hope Ballynure had of saving the game and they conceded a fourth goal in the 88th minute. What a difference a week makes as Desertmartin beat Tobermore the previous week. Tobermore went in front in the third minute before Desertmartin missed a penalty and hit the woodwork. This time around it was Tobermore who had the golden touch scoring another five goals without reply.